Handmade variation on the Type B-1 Summer Flying cap worn by Senior Airman John A. Greening. 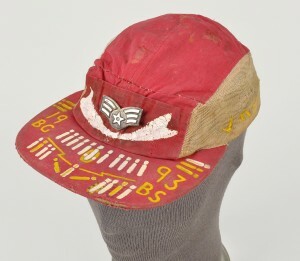 This handmade variation on the Type B-1 Summer Flying cap was worn by the donor, Senior Airman John A. Greening, while he was based in Okinawa, Japan during the Korean War. The painted portions record his service on the brim, including bombs representing the 28 missions he flew over Korea between December of 1952 and spring of 1953. Greening–a native of Michigan who later moved to Madison, Wisconsin–had an early interest in aircraft that was fed in earnest as a young teen during the second World War. When the Korean War broke and President Truman declared a State of Emergency, he decided he would rather avoid induction and instead voluntarily join the Air Force. A lifelong asthmatic, Greening believed he would never survive in a foxhole. He figured he would quickly be rejected by the Air Force, avoid the draft and return to work. If by some chance he passed, he at least had an interest in aviation. He was surprised when the Air Force accepted him, and even more so when he passed the subsequent physical. There was a sense of relief he was not as medically bad off as he had been led to believe his whole life. His new found health likewise awarded him a new sense of freedom. Greening’s enthusiasm showed immediately. After his technical training at both Lowry and Randolph Air Force Bases stateside, he was eager to be in the thick of it. He passed at the chance his rank afforded him to be the combat crew’s Center Fire Control, instead requesting to be a waist gunner and thus part of the flight crew. Since he believed he may not make it home again, he concluded it was better to at least do something he considered exciting with whatever time remained. John Greening (center front)–seen in his yet-unpainted cap–poses with his crew in front of their B-29 in Okinawa. Photograph dated December 31, 1952. The crew he trained with was eventually assigned to the 20th Air Force headquartered in Guam. He served with the 19th Bombardment Group, 93rd Bomb Squadron, and arrived at Kadena Air Force Base in Okinawa during December of 1952. It was here they hired a local Japanese servant they referred to as their “cabin boy,” a former pilot himself who never had a chance to fly before World War II ended. The Japanese gentleman left Greening with an exceptional memento when he hand embellished this cap for him, including painting “OKINAWA” across the back as a reminder of the several months he spent there. Despite his prediction, Greening survived his missions and came home in 1953, although not without experiencing some harrowing situations first. 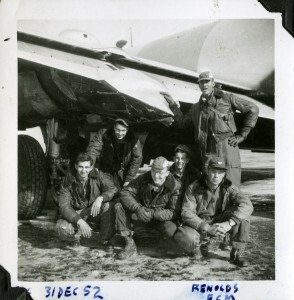 Greening made sure that this cap along with nearly 30 other objects, his photo albums, papers and oral history became part of the Wisconsin Veterans Museum’s permanent collection to preserve his notable story. You can learn more about Greening’s archival and object collections by visiting the WVM website in our online catalog.